Front and center, the nose plays a key role in the aesthetic appeal of the entire face. When the nose is well proportioned and symmetrical, it tends to blend in naturally with a person’s other facial features. 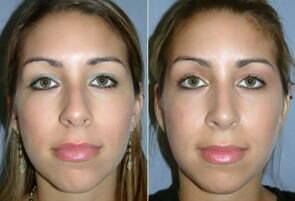 A nose that is crooked or too large or small for the face can look out of place, disrupting facial harmony. If you are bothered by the shape or size of your nose, rhinoplasty can help you get a new nose that looks more refined and proportional to your face, helping improve facial harmony as well as your confidence in your appearance. You may be a candidate for nose reshaping (rhinoplasty) if you feel like your nose is cosmetically unattractive or does not “fit” with other facial features. Rhinoplasty may also be indicated for abnormal appearance of the nose as a result of birth defects, injury, or disease. Nose reshaping is intended to produce a more attractive nasal shape and/or a nose in better proportion to other facial features. Rhinoplasty alone can achieve beautiful results, but in many cases patients can benefit from having another facial procedure performed at the same time. Combining chin implants with rhinoplasty is a popular option to restore facial balance more comprehensively, enhancing the improvements. Neck liposuction is another common procedure patients choose to have along with rhinoplasty to add definition to the neckline. Combining rhinoplasty with chin implant surgery can improve overall facial balance. Standard or “Closed” Rhinoplasty. Incisions are made inside the nostrils. The nasal bones, cartilage, and soft tissues are reshaped to improve the external contour. Open Rhinoplasty. Frequently used for difficult or larger noses. Involves one external incision across the columella (strut between the nostrils). Bones, cartilage, and soft tissues are reshaped under direct vision. Tiplasty. If only the nasal tip is abnormal, it may be corrected with either a standard or external (open) approach. Septoplasty. Dr. Movassghi may perform septoplasty during nose surgery to correct a deviated septum and improve breathing. Following your procedure, you will go home with an external cast or splint in place, which is usually removed in 7 to 10 days. The nose may be packed with gauze for 24 to 48 hours. Initial discomfort is easily controlled with oral medication. The majority of swelling and bruising subsides progressively over 2 to 4 weeks. External sutures (if any) are removed in 4 to 6 days. Internal sutures will dissolve. Patients are typically ready to return to daily activities after about 7 to 10 days, and exercise can gradually be resumed about 3 weeks after surgery, although contact sports should be avoided for a while longer. Since reshaping the nose involves repositioning cartilage and in some cases bone, bruising and swelling are common, which can obscure the results at first. You will notice a great deal of the swelling and bruising have dissipated after about 2-3 weeks; this is the time when most patients feel comfortable going out in public. By this point, others may notice that you look a little different than you used to, but should not notice you have had surgery unless you tell them. The semifinal result of a nose reshaping procedure is evident in about 3 months, although subtle improvements will continue for up to 1 year after rhinoplasty. Rhinoplasty is not covered by insurance if being done for cosmetic reasons. If however, the nasal deformity is due to recent injury, insurance coverage may be available. Pre-authorization information can be obtained from your insurance company.